Hello lovely readers, I hope your week is going great so far. So it's already August which is pretty scary. Today I'm going to be sharing with you my goals for the month but before I do I'm going to recap my July goals and see how well I did. 1. Reach 800 followers on Twitter- I'm now nearly on 900 followers on Twitter! 2. Reach 500 followers on Instagram- I haven't been putting much effort into growing my following on Insta so I didn't manage to reach that one. 3.Sort out my blogging schedule- Done! I now post on Mondays and Thursdays. 4. Get more active- I have been going out for far more walks so I guess I did this one. 5. Take some time out to think- I actually have been putting this off, bad Ella! 6. Go to an art exhibition- I went to a really interesting exhibition which you can read about here. 7. Try a new food- Erm does a new type of crisps count? They were really good in my defence. 1. Reach 1000 followers on Twitter. I may do a giveaway when I reach 1000, watch this space. If you don't follow me already you can here. Even if it's just listening to a band in a pub I really want to listen to some live music. As I have a part time job and an MA starting in September I'm not going to have much free time so I want to spend this month reading lots of non-academic books. 4. Go on a date with Dan. It feels like ages since my befriended and I went on a date together so I really want to go out and do something fun with him. 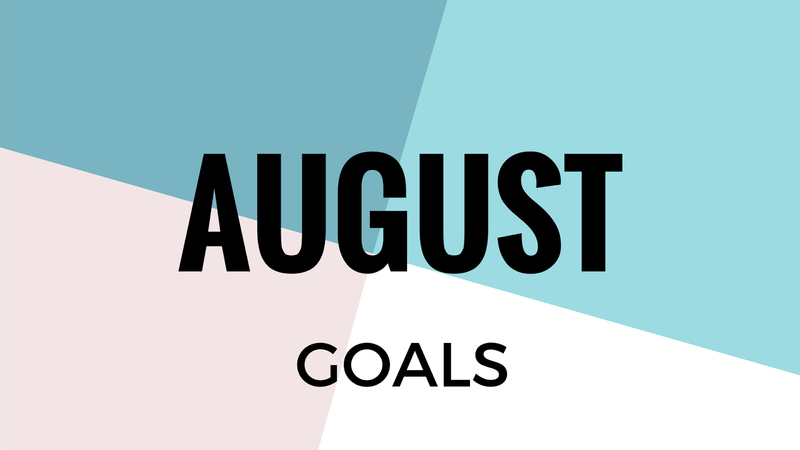 I hope you enjoyed reading my goals for August! What are your goals for this month? Do you share any of my goals?